I’ve been traveling for 13 days. I’ve been to Boston, Wiesbaden, and now I’m in Munich. Another week and I go home. The DocTrain East conference was wonderful. 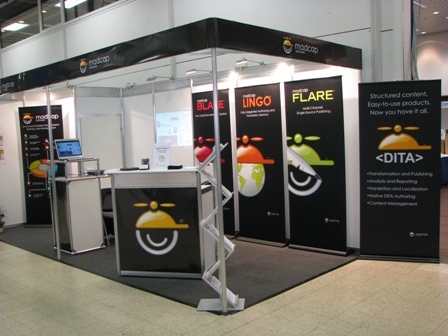 We announced our DITA solution the day the show started and were flooded with people who wanted to talk about it. The 3 days are sort of a blur, but I showed a lot of Blaze and Flare and talked about what our DITA thing is going to be. Just before I left, the guys were able to give me an early alpha build of DITA Flare, Phase 1. I can import DITA documents and create a branded help file in Flare. I can change skins, add corporate logos, and all the stuff you would expect after you get content into Flare. It’s a good alpha – it works mostly. We had a hard time getting across to people that our solution is not based on the DITA toolkit in any way. Our developers looked at it and decided that it was easier to modify Flare/Blaze. So no programming, no toolkit, just Flare or Blaze. But we’d explain that and people would say, disbelieving, “So how does the Toolkit integrate here?” “No Toolkit. All Flare or Blaze.” “Right, but how do I get the Toolkit installed to work with Flare?” ‘You don’t. Flare and Blaze deal directly with the DITA content. No Toolkit in any way.” “OK… But I don’t understand how this works with the Toolkit…” and so on. But when the light went on, people were super excited. I guess the Toolkit has some challenges. Saturday, while Mike was doing a post conference workshop, I met my oldest friend and we walked around Boston. Tom grew up in Boston and we had a lovely time on the walking tour. We would up in Little Italy and got to speak Italian to the waitress in Mike’s with our cappuccino and pastry. Tom and I met when I was an Army wife, married to my first husband, and attached to the NATO base in Naples, Italy. He was Navy, doing shore duty at the Navy base in Naples. Now, we get to see each other about every 7 to 10 years, so this was great fun. Good man and I had a wonderful time. We rode the subway back, which was delightful. Mike and I flew from Boston Logan to other airports, arriving at different times, in Frankfurt where we connected up with Anthony, who came in on yet another flight. We took the train to Wiesbaden and got checked into our hotel. We’d all slept 3 or 4 hours on the flights, so we screwed around in town until a normal bedtime. Mike and I were only(!) 6 hours off, as we’d adjusted to Boston. Tekom is an amazing show. It’s about 2500 Tech comm professionals, gathered together for 3 days of learning. The entire trade show happens at the central convention center and it’s packed with people and vendors. Apparently, they sold out the vendor halls. Trust me, that’s a lot of vendors! We had a young woman to help us with translations. Most people speak English to some degree but the Tech Comm vocabulary can be specialized. I’m from So Cal – I speak Spanish. I can almost be basically polite in German. Corrina was a delight. She has a degree in Tech Comm and works in Zurich. She’s young, passionate about our field, knows her stuff, and is beautiful. I delighted in watching the German-only speaking men lean towards her as she talked about our products. They were captivated by this bright, lovely, passionate woman. We called her our “Portable Language Device” and she giggled. She giggles a lot. Mike was Flare boy. I was Blaze, Analyzer, and X-Edit girl. When the sessions were out, we were hopping, especially the 2nd day. I missed lunch that day. I showed Alan Houser our DITA solution. He was impressed at the mix and match you can do. You can import a regular Word document, a Frame book, and DITA content into one project and then mix the output from these. So your help file can have topics from some of each, if you want. He said that no one else can do that or even come close. Made my day. Yesterday (Saturday), we all slept late and then went to the train station. Corrina was going home to Zurich, Anthony was going back to the States, Mike was off to Amsterdam, and I was heading to Munich. We all changed trains in Frankfurt and said our goodbyes. I won’t see Mike or Anthony for another 10 days or so. I arrived in Munich about 4 in the afternoon, just before dark. By the time I checked in and unpacked, it was dark. But today I walked around downtown Munich, took (bad) photos and generally enjoyed the nice day. I wore only a sweater because it was about 50F. But when the dark clouds blew in and the temperature dropped, I walked back to the hotel. I’m doing product shows for our resellers Tuesday thru Friday in Munich and Stuttgart. It’s going to be really busy so this down time is nice. We don’t get a lot of this when we’re doing shows and I’m appreciating it. One of the things that’s cracking me up is that I seem able to only speak Spanish or English to these nice Germans. Apparently, my brain is fine with another language and if another language, then I must be speaking Spanish. I spend a lot of time laughing at myself. It seems that everyone speaks English to some extent. But I was trained as an anthropologist and I want to be polite. In Spanish, apparently, which helps me not at all. But I have to admit, sitting in an outdoor cafe, in the late fall sun, drinking coffee, surrounded by German speakers this afternoon was fun. When I was 20, I was sitting at an outdoor cafe in Naples in the sun, one lovely spring day looking at the Bay, at Castel d’Ovo right there, Mount Vesuvius behind me. I’m living in Naples, I thought. How utterly extraordinary. I’m in Munich. How utterly extraordinary. OK, I haven’t seen rain lately, except briefly last week in Atlanta between flights. But it’s Fire Season for us in So Cal. We have winds and starting last Sunday, we have fires. The worst is north of LA in the western end of San Fernando Valley. Houses burnt, lots of acreage burnt, evacuations, all the normal stuff. We’re a migratory population. This could continue for us for another 6 to 8 weeks. We always hope not, but our rains don’t always start in late October, like we’d like them to. Sometimes it’s February before we see rain and that’s just no fun at all. We’d prefer a nice early rainy season with just enough rain to get Green by January but not so much rain that we have Flood. The PCOC show in Tennesee was very fun. I met lots of people and just generally had a really good time. Chattanooga seems like a great town to be eccentric in. I can’t tell you why, I wanted to just be eccentric. But the conference was a success and I think all left with useful information. On my way out of town, I was looking forward to going to Lookout Mountain where, they said, you can see 7 states. But the day was cloudy and overcast, so I wound up at the airport and left for Atlanta early instead. I spent about 6 hours in the Atlanta airport with Brenda H, who, it turns out, is very fun. She was stranded because Atlanta won’t let you check in to board your flight if it’s less than 45 minutes before your flight leaves. Brenda got to the counter with 40 minutes and they wouldn’t check her in. So she had to wait 13 hours to see if she could stand by on the next flight to Tucson. She ended up in Denver that night and made it home the next day. I felt really bad for her – normally, this is my traveling karma and she got it this time. But we ate and chatted and hung out and it was good. Turns out we have about 5 people in common, including 2 of my closest friends. I got in about 11pm Sunday, just dead. My body had no idea what time it was and so defaulted to bone weariness. I spent about 30 minutes talking to my husband and passed out until 6:30a. I got caught up a bit and then left for San Diego about 11 hours after I got home. As I was unpacking the suitcase to pack the overnight bag, I felt homeless, a transition with a rag top. David assured me that where ever I am is home for him, which helped. And we have a date this weekend, which I like muchly. We’re going to see Paula Poundstone at the University of California, Riverside. I’m very pleased and excited. I like her work very much and this should be fun. Maybe David will hold my hand and everything. I’ll be there and I think I’m doing a presentation of some sort. Mike will be there, showing tools and stuff. This is a virtual meeting for me and you don’t have to be onsite to see it. I’m presenting Blaze to the STC chapter. Mike and I will both be there, showing Flare, Blaze, and more. We won’t be there because of conflicts (see next) but Paul Pehrson is doing 2 presentations about our tools. Mike and I will be there with bells on, showing off products and having a good time. We won’t be there because of the obvious conflicts (see previous) but Bonni Graham will be doing a “Lessons learned moving from Robohelp to Flare” presentation. So, that’s lots of chances to see us at a trade show or learn about our products, even if we’re not there.